Hey, here we are again on the edge, so we had best read the theme verses for this column. (6) Humble yourselves, therefore, under God’s mighty hand, [so] that he may lift you up in due time. (7) Cast all your anxiety on him because he cares for you. (8) Be self-controlled and alert. Your enemy the devil prowls around like a roaring lion looking for someone to devour. No doubt you alertly noticed the words in all bold letters, which I will be expounding upon as we go. Certainly our Lord Jesus Christ epitomized obedience to the above verses, and in this month of April when we celebrate his resurrection, I am moved to dwell upon his magnificent accomplishment on my behalf. I hope that my standing in greater awe of it will inspire me to follow in his steps in my own life. If there were ever anyone who had to believe that God cared for him, it was Jesus. How did God ask His Son to humble himself? Was it by taking a vacation from his eternal chair at the right hand of God in order to slip into a diaper, play hide- and- why- go- seek- because- I-already- know- where- you- are with little Jewish kids, be bored in school, look on in disbelief at the antics of his fellow teens, whittle away a few years in a carpenter shop, tolerate the obtuse Apostles while keeping them awake at night by glowing, do some easy-for-God tricks like water-walking, food-multiplying and digital restoration, put on a good act in Gethsemane by sort of talking to himself, not exactly die but look dead for a while and then later show up alive and finally return to his chair under the guise of getting a promotion so that he could commission a huge blue rabbit to lead the celebration of his resurrection and torment helpless children by hiding from them colorful, but stolen chicken eggs, many of which (the eggs, not the children) would be olfactorily located months later under furniture by anguished parents??? Not exactly. (For you schoolchildren who remember the mother of compound sentences from my last column, that was the father). (12a) and that you, O LORD, are loving…. One of the worst things about the lie first told by Satan in Genesis 3 that “You will not surely die…,” that is, the lie that there is really no such thing as death (defined in virtually all dictionaries as “the end of life”), is that it gravely (get it?) dilutes the glorious truth of resurrection, as contrasted to the hideous reality of death. That lie, coupled with the lie that God became a man named Jesus, also greatly diminishes the magnitude of God’s love. How so? Because, as I think you will agree, especially if you are a parent, it took far more love for God to watch His only begotten Son suffer than it would have for Him to somehow violate all the laws He had set up and turn one-third of Himself into a baby so that He Himself could go through the torture and death. Of late in my life, I have been asking myself the question, “How BIG do I really see God’s love for me?” Since Scripture seems to indicate that our love for God (and thus our obedience, and thus His ability to bless us Ephesians 3:20-style as He so desires to do) is directly proportionate to our understanding of His love for us (“We love him because he first loved us”), it may be a relevant question for you also to ask. Perhaps, for each of us, the answer hinges on how BIG is our God, or, more accurately, how BIG do we see Him? The bigger God looks to me, the more faith I will have in Him. The more faith I have in Him, the more He can do for me. The more He can do for me, the bigger He will look to me. The bigger…ad infinitum blessum. Here’s another question I’ve been asking myself (go ahead and use it yourself if you like): “What would I be like if I really, really, really believed that GOD (as in Creator, Big Daddy, nobody messes with) LOVES (as in fervently desires to do every good thing for me that He can) ME (as in yes, the dirtball I know myself to be)? I’m sorry to say that I don’t think I know the answer experientially. But verses like 1 John 3:1 (NIV) inspire me to continue to pursue the quest of knowing it up close and personal: “How great is the love the Father has lavished on us, that we should be called children of God! And that is what we are!…” What would I be like? I think I’d choose the road to Ephesians 3:20ville rather than the one to Margaritaville (I heard the song and I just wanted to say that — I’ve never even had a margarita). I think I’d be more fun to be around (even without a margarita). OK, so I’m running it into the ground, this is the end of the paragraph. But I always did get some “surprises,” and I now realize that “Santa” was really my dad. Well, what kind of wonderful surprises do you think YOUR FATHER, GOD, wants to give you? And that brings up yet another question I’ve been asking myself (I sure hope I can answer some of these questions), given that God, my loving Father, just happens to be THE CREATOR: “Am I excited about the no doubt many scintillating surprises God wants to give me today, and am I expectantly and faith-full-y anticipating them?” I think I’m supposed to live in perpetual wonder. And oh yeah, I remember, I’m supposed to live each day looking for the BIGGEST surprise of all — JESUS CHRIST, in person, in the air! So then, how can I see God bigger? Yes, Jesus did say that if we have seen him, we have seen the Father, so it is imperative to press into intimate fellowship with the Lord. But for now, let us think about the biblical exhortation to MAGNIFY God. Have you ever thought about what that means? Sometimes I think that my God is too small. Huh? Well, in terms of Him being able to do for me, and for others via me, all He longs to do, He is only as big as I “see,” i.e., understand Him, and I’ll trust Him only that much. I want to see God as big as I possibly can, so that I have as much F-A-I-T-H (Fabulous Adventures In Trusting Him) as possible. Picture yourself scrutinizing the finer details of a local insect under a MAGNIFYING glass. Suddenly you find yourself back in a 1950s horror movie, before special effects were made really special through computer graphics, etc. In those days, boys and girls, movie “monsters” were actually grotesque-looking union insects hired to have their ugly faces filmed through magnifying lenses. To elicit fierce facial expressions, directors would threaten them by saying that if they did not comply, they’d see to it that the only parts they ever got after that would be in Raid commercials. Anyway…the point I am circuitously making is that when the bugs were magnified, they did not actually get bigger, but they did LOOK BIGGER. Ditto for God, so how do we MAGNIFY Him? If you check out verses that have the word “magnify,” you will find that some of the ways we can make God look bigger are by thanking, praising, remembering, meditating upon and rejoicing in Him. Oh yes, and by obeying Him. Also, based upon Acts 2:11 and 10:46, it looks like speaking in tongues is another means by which you can MAGNIFY God. Why? Because it reminds you that God is real, that He loves you so much that He gave you His Son, that He raised Jesus from the dead, that the risen Christ lives in you via holy spirit, that you can do the works that he did and that you are guaranteed non-metered parking in Paradise. Wow, that’s BIG!!! The more that you and I live in the light of these magnificent truths, the more our Father’s heart is magnified to other people in our lives, and the better chance they have to get in on the fun. The more real God and Christ are to us, the more effectual we are as “witnesses of those things which we have both seen and heard.” The title of George Mueller’s biography is Delighted In God. That’s how I’d like to be described, how about you? I think that what I should be delighted about is God’s love and His ability to help me do things He asks me to do that are way too big for me to do by myself. Another phrase I love is one Oswald Chambers uses in My Utmost For His Highest — “undaunted radiance.” Shining like that will get a few people’s attention, huh? And that brings us back around to “where we came in” — Jesus Christ — The Man who is the Plan because the First Man ran. He is our sterling example of always doing God’s will rather than his own. He was certainly delighted in God, and his undaunted radiance showed up as selfless service to others. He rose from the dead so that he could “re-present” himself to the world in and through you–and me. Jesus is the Promise, and in him, all the promises of God are “YES!! 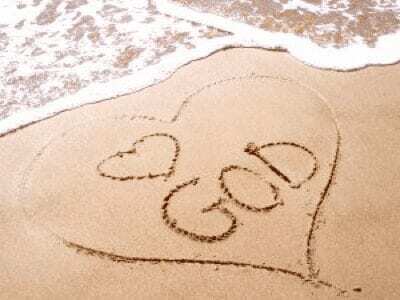 !” He is our proof that God’s love for us is limitless. Because he cares for us, let us each therefore take his hand and walk with him the path set before us. Yes, it will require that we humble ourselves, that is, choose to do his will rather than our own, but we have his Word that our doing so will allow him to lift us up. Like Paul, let us “…press on to take hold of that for which Christ Jesus took hold of us.” There are many wonderful surprises ahead on this path. The Word of the Lord to us is, “Let’s go get ’em — together.” See you in Church…on the edge.